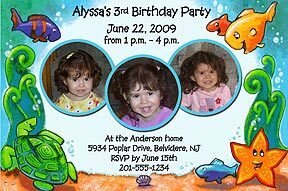 Photo Kids Birthday Invitations - Photo Party Invitations For Your Child's Birthday ! Whether you're looking for 1st birthday invitations for your little one's first party, or you need kids party invitations for their 2nd, 3rd, 4th celebration and beyond, our photo kids birthday invitations can't be beat. We combine your multiple photos and personalization with our original designs to create unique photo kids party invitations just for you. 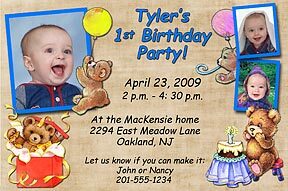 Our kids birthday party photo invitations are available in two sizes: 4x6 and 5x7 and are brilliant archival-quality real photographs with accompanying envelopes. Teddy Balloons Photo Birthday Invitations © Send us 3 of your favorite photos with your message and personalization. Specify pink or blue background. Teddy Party Photo Birthday Invitations ©Send us 3 of your favorite photos with your message and personalization. 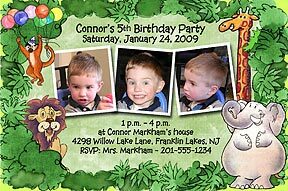 Jungle Animals Photo Party Invitations ©Send us 3 of your favorite photos with your message and personalization. 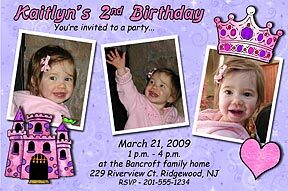 Princess Party Photo Birthday Invitations ©Send us 3 of your favorite photos with your message and personalization. 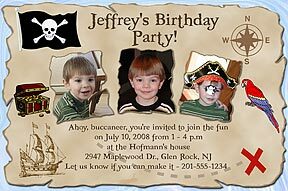 Pirate Photo Birthday Party Invitations ©Send us 3 of your favorite photos with your message and personalization. Under the Sea Photo Party Invitations ©Send us 3 of your favorite photos with your message and personalization. Messages on above kid's birthday invitation photo cards are only suggestions. You may change the wording to create your own, personal message. Look at the sample text used in the card of your choice as a guideline to how much text can be used. Most of the children's birthday invitation designs can be changed into photo thank you cards for sending after the party. Just let us know what you'd like your photo cards to say, and in most cases, we can adapt the design for your needs. We always email you a proof of your photo kids birthday invitation order within a couple of business days of receipt of your emailed photos and order information. This is so that you may check it for accuracy, and we only send your order to production after we have received your approval. Please check your email often for your proof to avoid unnecessary delays. If you have not received your proof within 2 days, please contact us and we will resend it. Minimum order is 25, but you can order any amount after that. Many photo kids birthday invitation companies force you to order in packs of 25, (25, 50, 75, etc.) but you can order from us 38 or 52 or 112 - or whatever is exactly the amount you actually need. Are you looking for photo birthday favors? We have 2 x 3 inch or 3 x 4 inch kids birthday photo magnets available. We also have kids birthday photo bookmarks and round photo magnets, buttons, keyrings and mirrors.